Can you supply info about my friend or relative who worked for the Reading? Unfortunately, there is no place where Reading Railroad employee records per se were preserved. The RCT&HS archival collection of records of the Reading Railroad includes some scattered references to employees. These records are currently in storage until we establish a permanent archive at the Reading Railroad Heritage Museum, at which time we'll be in a much better position to assess what employee records we have. At the present time, we simply do not have enough people to search our records for employee information. We appreciate your understanding. A place with a large collection of Reading Railroad documents is the Hagley Museum & Library in Wilmington, Delaware. Their holdings are particularly extensive for the period up to 1907, but trying to find mention of a specific person (unless they were an executive) would be VERY time consuming, with slim chance of success. Records pertaining to the Reading Railroad Relief Association (the in-house employee benefits fund that was started in the late 1890’s) would be the best place to start at Hagley. The United States Railroad Retirement Board (like Social Security for railroaders) maintains information on railroaders who worked after 1936. Please visit the genealogy section of their website for information on a (paid) search of their records. 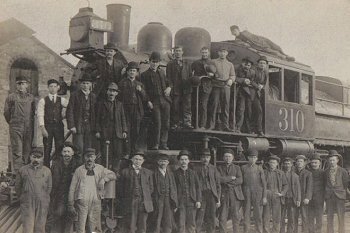 The Reading Company-published Reading Railroad Magazine and its predecessor The Pilot mention many employees at random in their news columns on employee activities, but there is no index. Finding a specific name would require reading many years of magazines, again with no guarantee of success. Fairly complete collections of this magazine are at Hagley (see above) and the Railroad Museum of Pennsylvania at Strasburg.